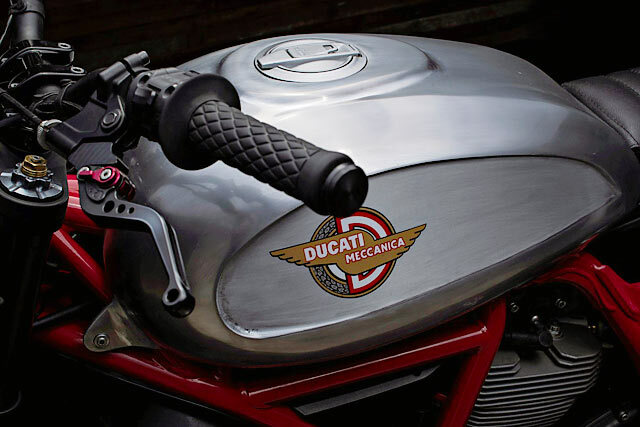 Benjie Flipprboi, the head of BCR, is a fan of Ducati’s lightweight, air-cooled v-twin. 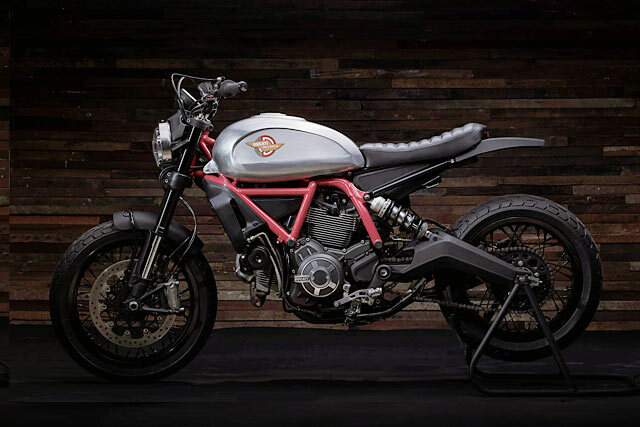 ‘I think Ducati released the Scrambler two years ago with riders in mind. Whether you’re a beginner or an expert, the Scrambler is a bike that can be ridden on the pavement or on rough roads.’ And the owner of the donor bike was riding the wheels off his, to and from work and out and around country lanes. 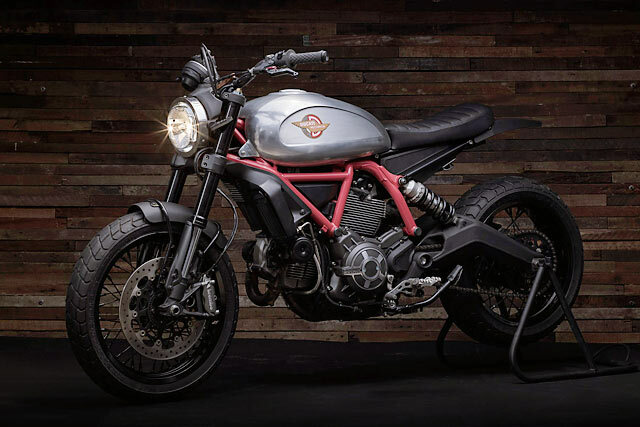 Now the Scrambler comes in half a dozen variations, the chief difference being a change in colour scheme and wheels. 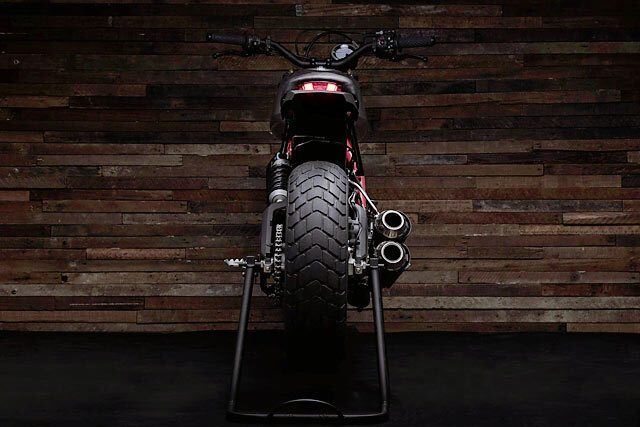 This particular one is the ‘Full Throttle’ variant and it came to the team with some light modifications already made – an Akrapovic slip on exhaust, custom wire wheels and LED lights. But to get the bike to stand out, it’d need a lot more attention. And the guys at BCR knew exactly where to begin. ‘As with all our builds we started with the gas tank,’ Benjie says. ‘For us it dictates the overall look of the bike. 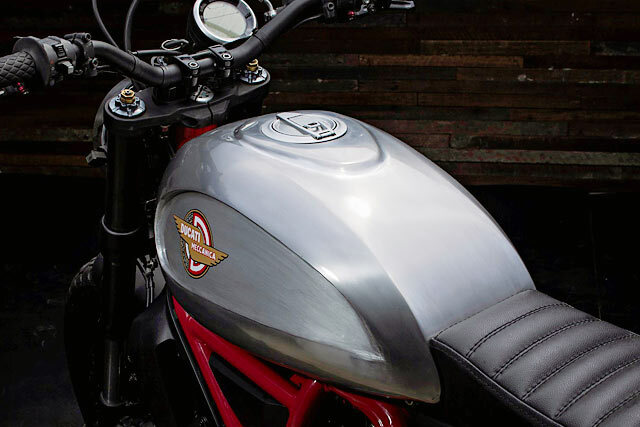 We wanted to maintain a similar capacity to the stock model so we kept the dimensions very similar.’ The team turned out a new aluminium tank in a teardrop shape while keeping the edges sharp – a nice touch that makes the tank match the rest of the bike. Benjie also shifted it up slightly, to draw more attention to the trellis frame. After the tank BCR turned to the stock seat and subframe. While the standard model has more plastic in it than an Orange County housewife those covers can’t simply be removed – those shrouds hide a mess of wires. So the subframe was lopped off and a new one made out of ⅝” chromoly tubing. This was lined up with the higher base of the new tank, ensuring the lines flow well from front to back. A new box was fabbed up to house the battery, as well as the ECU, ABS pump and all the electronic bits and bobs that keep the 806cc engine growling. The tidy little stock tail light was reused and tucked into the rear fender, which was made with sharp edges to match the gas tank. 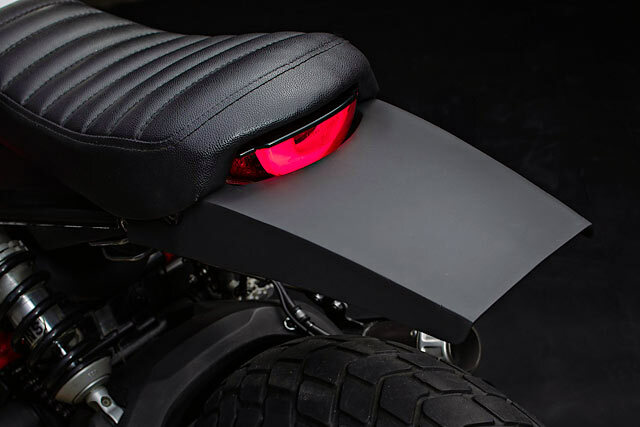 The stock Ducati seat, which is wider than a Harley pillion’s bum, was ditched in favour of high density foam trimmed in vinyl with ribbed stitching. The standard seat locking system was reused, allowing the whole thing to snap on and off with a turn of a key. 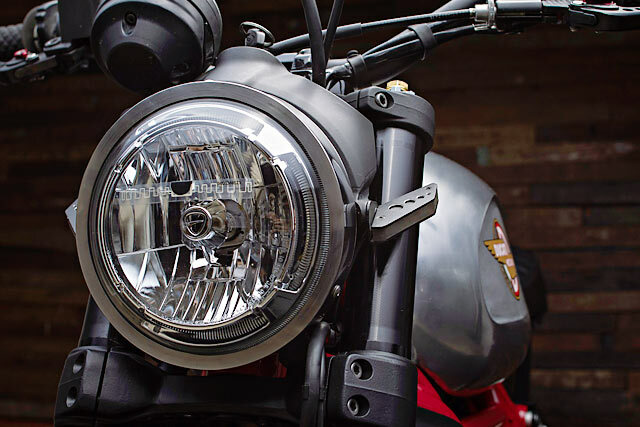 To match all that the front fender was made beaten from aluminium and the plastic assassination continues at the headlight, with the black plastic surround replaced by a set of rings in stainless – also in a brushed finish. 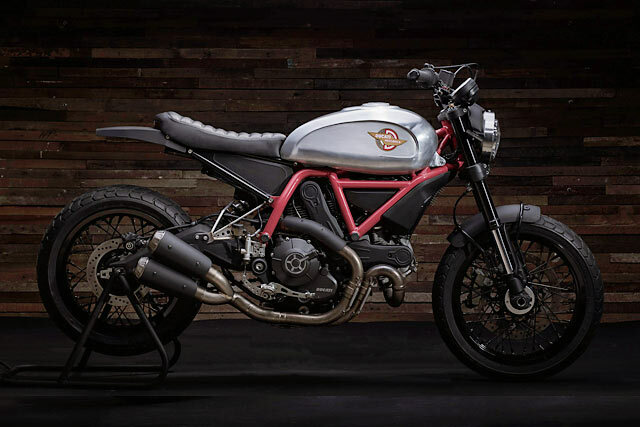 All that work has the Ducati Scrambler looking absolutely mint – and far better than the standard, plastic-coated trim. 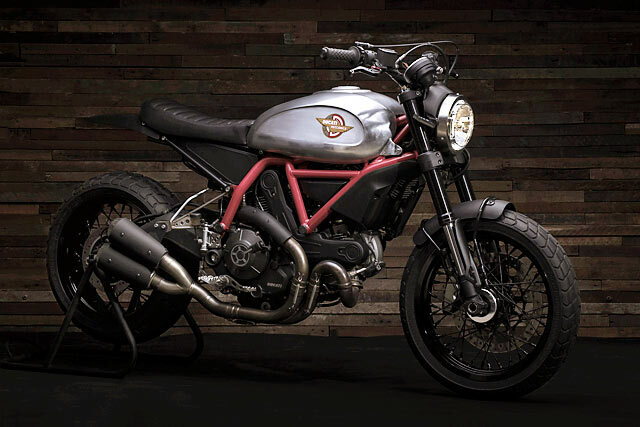 Benjie’s take on the Scrambler has it looking near-stock, with a better finish and attention to detail than any Scram in the lineup. And with no compromises on rideability, it’s still a barrel of laughs to fang around on. The team agrees. 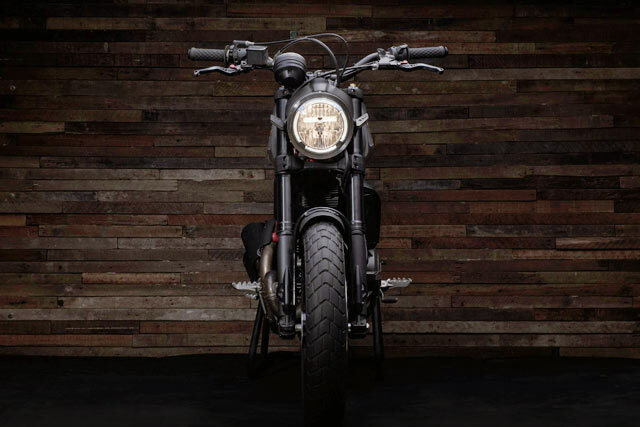 ‘The Scrambler build is one of our favorites. The changes are subtle, the bike now holds a new look, a new character and a new attitude’. Damn straight.